Put yourself in this situation: You start at the new school in term four, the leadership team you inherit is retiring or requesting to step down and the budget doesn’t allow you to recruit externally. There is a feeling of hopelessness among the staff and they are wondering where this new principal is going to take us. These are the types of situations you need to be prepared for when you step into the principal role. If you start thinking and planning now, you will be more confident when your time comes. There are lots of theories about the structure of leadership teams. I like to keep it simple and include, Principal, Deputy Principal, Maths Leader, Literacy Leader, Student Wellbeing Leader and perhaps a ICT or STEM leader. Any time I’ve been presented with leaders who look after F-2 and 3-6 I reassign them to whole school curriculum roles as soon as i get there. It’s too difficult to get the whole school approach you will be looking for and the messages about teaching and learning get muddled. I also run a secondary team of level or PLC leaders to coordinate the teaching teams. This team is the conduit between the staff and myself. The leadership team is where the action is and where key decisions are made. The next battle is selecting the right personnel. In my early days as principal, I played it safe and selected staff who I knew were loyal and would agree with my direction and decisions. Depending on your situation that can be very helpful. With experience, I’ve come to realise that the best results come when there is varying opinions at the table creating more rigorous debate. The challenge is selecting the right mix of leaders who will both challenge and be respectful of each other. My advice is to always run a formal process for these positions, it sorts out who really has the skills to step up. I think there are a few key points you need to consider when doing internal promotions and these need to be raised at the interview. I think we all ask the standard questions around curriculum, change, data etc…. but how often do we dig deeper to the real issues? I’m a believer that you can teach anyone data and curriculum but leadership relationships are much more complex. That is the difference between someone who is invisible and someone who stands out as both a team player and potential leader, as well as someone I can count on. So, I always ask a few probing questions, hoping to dig deeper into their understanding about the role and how this might impact them. 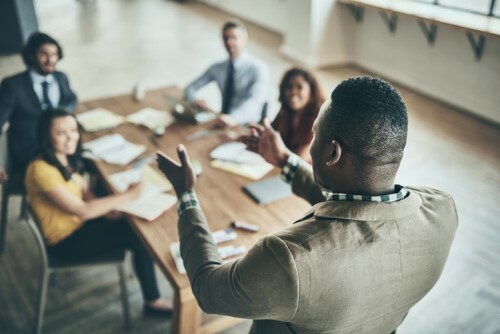 Generally when they are making their first step into leadership they are oblivious to the impact this will have on their relationships with their colleagues. How do you see this role impacting your relationships with your colleagues? What will you do when a teacher refuses a direct instruction? Have you thought about how you will manage yourself in times of extra pressure and stress? What will you do when a staff member makes comments behind your back about an interaction you had? What steps will you take when a teacher goes against a recommended behaviour strategy you have agreed on? I remember finishing one particular panel and my deputy commented on how tough an interviewer i was. The reason was straight forward, I wasn’t necessarily expecting the interviewee to have all the answers, but i wanted them to think about the issues which hadn’t crossed their minds. The added pressure of leadership and politics can be too much for some teachers and you need to be sure the team you select are up for the challenge. Something else to consider is whether you offer incentives such as higher duties payments for these positions. On one particular occasion I didn’t have a choice as the school didn’t have the money to offer. This ended up being a blessing in disguise and the teachers who really cared about the school and wanted to learn put their hands up. They turned out to be one of the most effective teams I ever worked with. The financial reward came for them later, when they started applying for promotion.